The PechaKucha presentations will be followed by an on-stage interview with writer and activist Mark Boyle. Mark is the author of ‘Moneyless Man: A Year of Freeconomic Living’, ‘The Moneyless Manifesto’ and ‘Drinking Molotov Cocktails with Gandhi’. He also writes intermittently for various international newspapers and magazines, such as ‘The Guardian’ and ‘Permaculture Magazine’. 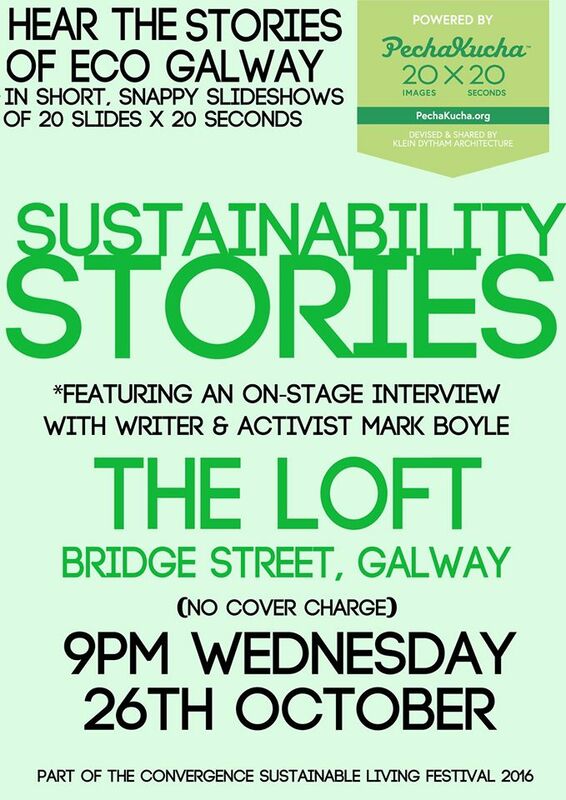 This free event takes place on Wednesday 26th October starting at 9pm and finishing about 11pm in ‘The Loft’ (upstairs from ‘Seven’ on Bridge Street, Galway City). All welcome! “Powered by PechaKucha” events are one-off events that are separate from regular city-based PechaKucha Nights, and are usually held as part of festivals and conferences, but can also act as standalone events. These events include presentations that use the PechaKucha 20 images x 20 seconds format. This entry was posted in Other Transition Galway Events by transitiongalway. Bookmark the permalink.